Forgot Password? | Forgot Member ID? Are you a new user? Register Now! 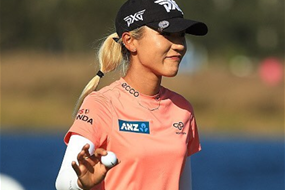 Lydia Ko has completed another great week on the LPGA Tour to finish in a tie for 8th place after four good rounds at the Bank of Hope Founders Cup which ended today. Ko was consistent as ever with three matching rounds of five-under 67 to start the championship and after two birdies in her opening two holes today, it looked like things could only get better. After making birdie on seven, the world number 15 then made 11 straight pars which didn’t allow her to catch the leader Jin Young Ko. The two-time major champion looks dangerous this year and one feels it won’t be long before we see Ko collect her 16th LPGA Tour title. Northland’s Luke Brown created a memory of a lifetime finishing with an eagle two on the 72nd hole to win the New Zealand Stroke Play Championship at the Christchurch Golf Club. After starting the day two shots behind Kobori, Brown found himself with a three-shot lead with three holesto play. However, bogies on 16 and 17 coupled with a clutch Kobori birdie added immense pressure as they entered the drivable par four 18th all square. After the two-shot swing, Brown collected himself to then produce the perfect drive and leave himself 20 feet for eagle to take home the title in front of a packed clubhouse. As Kobori has done so often over the past three weeks he came up with another stunning putt for birdie to force Brown to make his putt and the rest is history. Auckland’s Carmen Lim has claimed a breakthrough victory at the 2019 New Zealand Stroke Play Championship in style by a monstrous seven-shots at the Christchurch Golf Club. Lim has completed a near-perfect week with rounds of 72, 70, 69 and 69 (par 74) to enter the winners circle after many years of threatening at the top level. Starting the day four-shots ahead of runner-up and fellow Aucklander Vivian Lu, Lim never gave her a chance as they went shot for shot in the opening nine to both make the turn at four-under par. Lim all but confirmed the win early in the back nine when she started with a birdie while Lu was unable to keep up with a double bogey, bogey start to end her run at the title. “I feel like I’ve been waiting for this moment for some time now, so yeah it feels amazing,” beamed the 15-year-old. She joins some big names in the world of golf, including her idol Lydia Ko who won back in 2011.